When Sloto’s weather is just right, it’s time for a perfect picnic of wins! 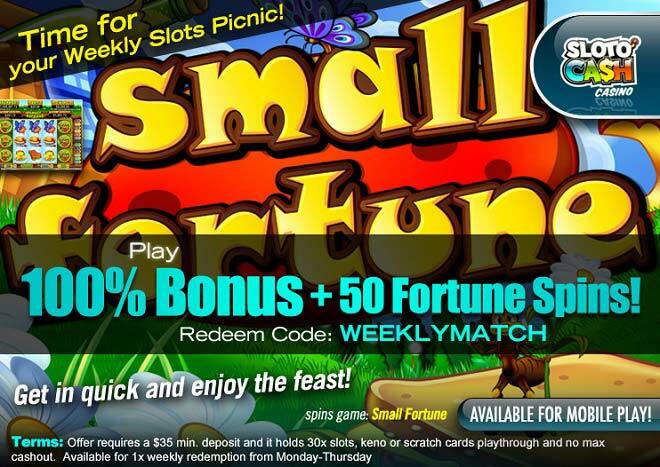 A moveable feast of wins awaits this April when you deposit as little as $35 to claim a 100% Match + 50 Fortune Spins! Spin the reels of Small Fortune with your chance to win a major or minor jackpot, a and a top prize of 7,500x your wager! This will be one heck of a picnic you’ll want to do over once per week! Play 100% Bonus + 50 Fortune Spins!